The Moore Student Union Building (the SUB!) 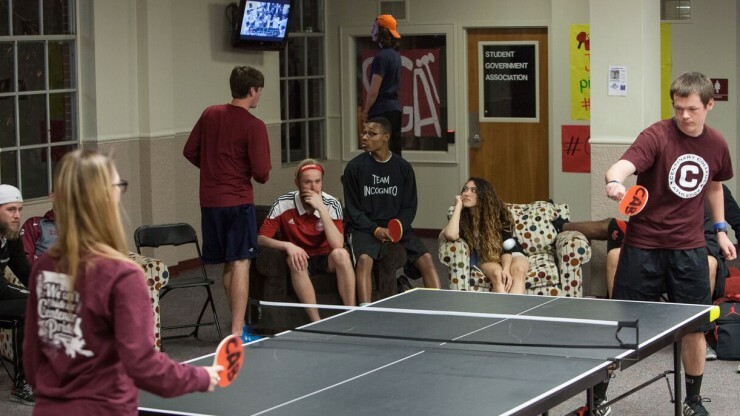 is the hub of student life at Centenary. The SUB is a great place to hang out and watch TV, relax, get competitive in ping-pong, or grab a bite to eat, but there's work going on in here, too! Many student organizations have their headquarters and meetings in the SUB, and it also houses the bookstore, the post office/mailroom, and the Offices of Residence Life, Student Involvement, and the Dean of Students. The SUB features a cozy TV area, ping-pong tables, dart boards, a foosball table, and a pool table. You can check out all the necessary equipment from the SUB info desk with a Centenary ID. Randle's is located on the main floor of the SUB and is a great place to grab quick meals, snacks, and Starbucks coffee. The Centenary Bookstore is located on the main floor of the SUB near Randle's. You'll find textbooks, class supplies, and Centenary clothing and memorabilia here. Find a student org and get involved! The SUB is home to several student media organizations as well as the Centenary Activities Board and the Student Government Association.